The names Steinway & Sons and Daniel Barenboim are closely intertwined. Over the decades as a Steinway artist he has continued his close and friendly relationship with the house of Steinway & Sons. Become one of 25 people to own the limited “Daniel Barenboim Edition” by Steinway & Sons! Daniel Barenboim visited the selection hall in Hamburg on 10 October 2015 exclusively for Steinway & Sons to personally select 25 Steinway & Sons grand pianos, models B-211 and A-188, black polished, and sign the casting plate of each one! These instruments are a rarity of almost inestimable sentimental value! “DANIEL BARENBOIM EDITION” by Steinway & Sons. In honour of Steinway’s 160th anniversary, we are proud to announce our latest collaboration with renowned furniture designer Dakota Jackson: the stunning Arabesque – a limited edition with a unique and innovative design approach. Like the intimate, lyrical creation by Robert Schumann entitled "Arabesque", or Debussy's pensive masterpiece of the same name, the 160th Anniversary Limited Edition Arabesque by Dakota Jackson touches the soul with a pure beauty. Conceived by Dakota Jackson for the 160th anniversary of Steinway & Sons in 2013, the instrument captivates with exquisite design accents, giving an impression of fluidity and movement. In ballet, an "arabesque” is a pose held suspended in time, with the limbs of the dancer impossibly extended. It conveys a sense of channeled energy, flowing freely through the tips of the fingers and toes, outward and upward into the ether. The cooperation between Steinway & Sons and Dakota Jackson began in 2000 with the development of the highly successful Tricentennial Limited Edition for the 300th anniversary of the piano. Now, with the 160th Anniversary Limited Edition Arabesque by Dakota Jackson, the special partnership grows still stronger. "To me," Jackson says, "Steinway is synonymous with Piano. I wouldn't consider designing a piano for any other company." To commemorate the 70th birthday of a true creative genius—legendary musician and songwriter John Lennon - Steinway & Sons proudly introduced the Imagine Series Limited Edition piano in 2010. On October 9, 2010, John Lennon would have celebrated his 70th birthday. To commemorate this real legend and his achievements, THE IMAGINE SERIES LIMITED EDITION was launched by Steinway & Sons in that year. Like the songs of John Lennon, the Imagine Series is the perfect harmonisation of music with creativity to achieve an end result that is much greater than the sum of its parts. 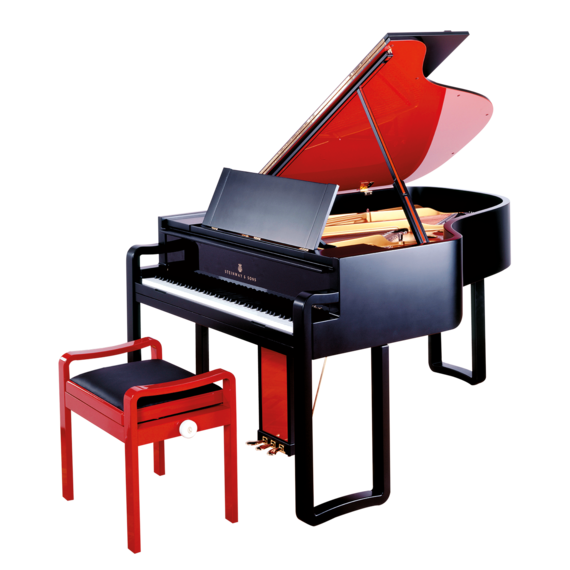 The Imagine Series Limited Edition WASs modeled after the white Steinway grand piano that John presented to Yoko Ono on her birthday in 1971. Each piano incorporates John's signature on the key cover, the first notes of his song “Imagine” on the iron plate and a medallion indicating its uniqueness. Some of his unique drawings are further features of this Limited Edition. One of these is incorporated on the music desk of each piano. The customer could choose between one of seven different John Lennon original drawings: “Come Together”, the title of the opening track on the Beatles' historic album, "Abbey Road," which reflects John Lennon's desire to bring people together, “Grand Piano”, a drawing that captures the songwriting process — as musician and piano become one, or “Freda People” which exemplifies John Lennon's passion for using music for the benefit of mankind. “Self Portrait”, perhaps John Lennon's most famous drawing, was sold out more or less immediately. “Borrowed Time”, “Frog Pondering” “Power to the People have been further motives. Only 25 pianos of each design have been produced so that the total number is limited to 175 grand and upright pianos worldwide. “You may say I’m a dreamer” – a portion of the lyrics “Imagine” that changed the world grace the inside of the piano, in clear view when the lid is open, and a special medallion with the series name/number and Lennon’s signature in Asian style are further features of this extraordinary grand piano. This special instrument has already attracted musicians, fans of John Lennon as well as art collectors – it is both a majestic musical instrument and a completely unique work of art. Please contact your authorised dealer or Steinway & Sons and ask whether some instruments of the special edition are still available. This Limited Edition was presented to the public in 2005 to celebrate the 125th anniversary of the Steinway factory in Hamburg. Count Albrecht Goertz, a man with a passion for design and creator of arguably the world's most beautiful sports car - the BMW 507 – created this grand piano which features a clear, pure lines. In 2005, to celebrate the founding of the Hamburg Steinway factory 125 years earlier, Count Albrecht von Goertz designed a special anniversary grand piano, an instrument notable for its elegant simplicity. Count Goertz was the legendary designer of the BMW 507, considered by many to be the world’s most beautiful sports car. 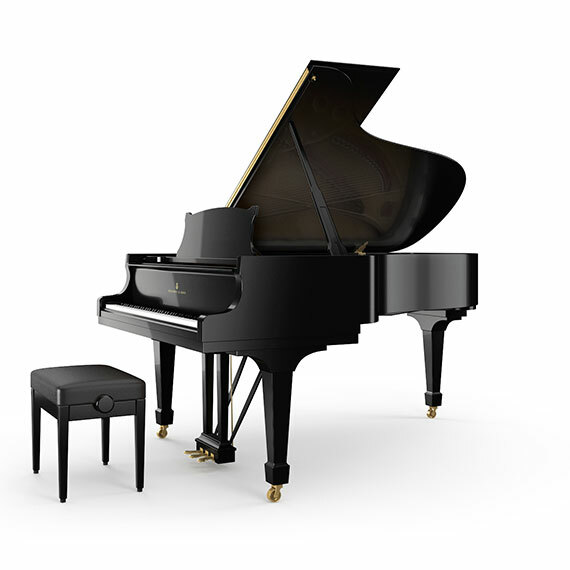 True to his design principles, Count Goertz, chose to retain the classic Steinway black finish, focusing instead on endowing various components with the sleek lines for which he is renowned. The result was a timeless design with a hint of sensuality. Not one to tamper with the perfection of the Steinway’s iconic shape, Count Goertz decided to accentuate the finish, creating a dynamic interplay between contrasting satin and highly polished surfaces. By focusing on the essentials, Count Goertz’s 125th Anniversary Limited Edition Grand Piano, this very special Model A-188, is remarkably elegant and beautiful. Count Albrecht Goertz was an industrial designer and creator of arguably the world’s most beautiful sports car, the BMW 507. He gladly accepted Steinway’s invitation and prepared to face his “last challenge,” as he put it. From stylish cars to exclusive fountain pens and functional furniture, the connection between these very different products created by Count Goertz is their timeless aesthetic appeal. His designs have never been elf-referential or extreme. Rather, he focused on the essentials, underlining the functional elements of each individual product without introducing distractions. Count Goertz has always treated the creation of this anniversary grand piano as the end of his career. He died on October 27, 2006, at the age of 92. The cooperation with him remains unforgettable among the Steinway staff. "Music is movement, and with the adrenaline flowing, I began to play with ideas for suggesting it in the design." In celebration of the 300th anniversary of the invention of the piano in 2000, Steinway & Sons and internationally acclaimed furniture designer, Dakota Jackson, created the Tricentennial Limited Edition piano. The introduction of this piano marked the first time since the early 20th century that a Model A grand piano was offered by Steinway in the Americas. In addition, the Tricentennial was the first Limited Edition piano to be jointly created at Steinway & Sons’ factories in New York and in Hamburg. In order to reflect Steinway pianos’ international appeal, this particular piano combines the expertise and craftsmanship of both Steinway factories. As Jackson approached the complex task of creating a design that would be innovative while maintaining the traditional beauty of the Steinway piano, he was aware that great care had to be taken. “The very simplest alteration to the classic form would require a change in the way people perceive the piano,” he says. “After all, it has been an iconic symbol for three centuries. Therefore, any alterations could be considered only if they enhanced the design and validity of the piano.” As a first step towards creating the new Tricentennial design, Jackson reduced the piano to its essential form – a wood case enclosing a cast-iron harp or plate - and began designing it from the “instrument’s soul” out. Jackson asserts that the final design of the Tricentennial breaks with traditional piano design by creating a continuous, flowing line from the back of the piano to the floor, merging the piano’s body and legs. Typically, Jackson says, this flow is interrupted with a series of stepped details reminiscent of classic Hellenic columns and structures. Lid design: when open, the lid folds back on itself in a series of tapered sections, which fall at an angle, creating a fanned effect. Lid topstick: the topstick hugs the case’s inside “S” curve when the lid is closed, and becomes a striking design element when opened. Music desk: designed to hold sheet music like a pair of open hands, the angular music desk is mounted on a bearing to roll smoothly toward and away from the player. The rim and legs: the rim is raised in back, and the rear leg has been pulled forward and inward, creating a cantilever. All three unadorned legs taper gently to the casters on which they rest. Dakota Jackson was chosen to collaborate on the design of Steinway’s Tricentennial grand piano not only because he is one of America’s foremost furniture designers, but because his creations are noted for their pure, clean lines that celebrate function and beautifully uncluttered form. Jackson began building his reputation for furniture design more than 35 years ago, and he has created couture, one-of-a-kind pieces for celebrities and private residences around the world. Moreover, his corporate client list is filled with names such as Estée Lauder, The Four Seasons Hotel in New York, and The Regent Hotel in Hong Kong, as well as the executive offices of General Motors, IBM, Dell Computers, Columbia Pictures and Time Warner. With the commission to design Steinway & Sons’ Tricentennial Limited Edition piano, Jackson returned to his design-by-commission roots. Growing up in a family of magicians in New York City, Jackson toured the country as a child performer, later turning his creative focus to custom-designed furniture for the private and corporate clients listed above. Jackson says that “innovative design is inextricably linked to innovative technology,” and he approached the Tricentennial design on that basis. A lecturer at design schools and museums across the country, Jackson has won numerous design awards, including a National Endowment of the Arts Award, and an American Institute of Architecture Award for the design of a Winnetka, IL synagogue designed in collaboration with H. Gary Frank. In 1998, Jackson also collaborated with well-known architect Peter Eisenman on the design for a Dakota Jackson showroom in the Pacific Design Center in Los Angeles. Jackson designed the David Yurman Boutique on Madison Avenue, and currently is designing the chapel at the North American headquarters for the Union of American Hebrew Congregations, both in Manhattan. Jackson’s furniture is displayed in museums throughout Europe and the United States, and his company has 20 design showrooms across the country. The company’s main showroom is in Manhattan, and its two factories are in Long Island City, N.Y. where Steinway & Sons’ North American headquarters and factory are also located. The 150th Anniversary Limited Edition is an artistic masterpiece to be treasured for the joy of its incomparable sound, and for its lasting place in Steinway & Sons history. Exquisite period details include a carved piano desk featuring the Steinway Lyre, half-round beading along the piano’s bottom rim, and beautifully carved, fluted legs. A special commemorative 150th Anniversary medallion complements each piano. One of the most historic Steinway grand pianos of this classic design was played by legendary Steinway artist Ignace Jan Paderewski on his famous United States concert tour in 1892-93. The piano, inscribed by Paderewski, stands proudly in the National Museum of American History in Washington D.C. The 150th Anniversary Limited Edition was available in ebony with a satin finish and nickel-plated hardware, or in Rosewood or African Cherry with a satin luster finish and satin brass hardware. To celebrate the 150th Anniversary of Steinway & Sons, renowned international fashion designer Karl Lagerfeld created a commemorative piano reflecting his bold yet impeccable style. THE S.L.ED by Karl Lagerfeld was created in 2003, and was one of two instruments to celebrate the 150th Anniversary of Steinway & Sons. Renowned international fashion designer Karl Lagerfeld designed a commemorative piano that reflected his bold, yet impeccable, style. With dramatic, highly-polished red and elegant black satin finishes, this stunning instrument is a study in powerful contrasts. Mr. Lagerfeld’s innovative design features a rectangular music desk and legs. Winner of numerous honours and awards throughout his career, Mr. Lagerfeld is one of the most celebrated fashion designers of the 20th Century. A native of Hamburg, Germany, he was 17 when he first entered the world of haute couture. Mr. Lagerfeld’s unique vision has led famous companies like Chloe, Valentino, Fendi and Chanel to the pinnacle of high fashion success. And the collections he has designed for the Karl Lagerfeld brand have also brought him international acclaim. Mr. Lagerfeld is known for his bold vision, use of bright colours and unusual pairing of styles. His innovative spirit and design genius are beautifully expressed in the Steinway 150th Anniversary Limited Edition Piano.